An ancient temple sacred to Lord Ganesh, Siddhivinayak Mahaganapati Temple is regarded by the pilgrimages from all the corners of India. 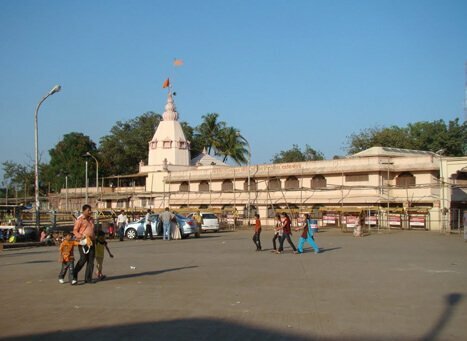 Siddhivinayak Mahaganapati Temple is visited by people who wishes to bring back harmony in the life of married couples. The current temple complex, which is sprawling over an area of 3-5 acres, has an audience hall and the main sanctum. Main Shikhara (pinnacle) adorns the sculptures of the Ashtavinayaka. According to the legends, the history behind the temple is that once upon a time there was a Dandakaranya forest, where Katkari tribe used to stay. Sage Kanva, who was a part of the tribe, used to reside in the same forest. He (Sage Kanva) adopted a girl child called Shakuntala as she abandoned by her parents. One fine day, King Dushyanta of Gandhara Kingdom was passing through the Dandakaranya forest to go for the battle. In the forest, he saw Shakuntala, where he immediately fell in love with Shakuntala, and got married according to the Gandharva rite in the hermitage. Immediately after marrying Shakuntala, the king left for the capital war and gave Shakuntala a royal signet as a sign of their love; promising her that he would return. Years passed but Shakuntala's husband, Dushyanta was nowhere to be seen. One day, Shakuntala was so lost in her world that she ignored the reverential attention to sage Durvasa. Known for his short temper, Durvasa cursed her saying that whomsoever Shakuntala was thinking about would forget here. Later, Durvasa took back his curse and gave her a boon that if Shakuntala shows the personal token to Dushyanta, he will remember everything. Sage Kanva asked Shakuntala to built a shrine in the honor of Lord Ganesha. He (Sage Kanva) even assured that by sincerely praying Lord Ganesha, Shakuntala would find her husband, Dushyanta. And that's how the temple came into existence. The initial structure of the Siddhivinayak Mahaganapati Temple, built by Shakuntala, was submerged in a water tank. It was during the rule of Peshwa Madhavrao I, the temple was found while resolving the problem of drought. Image of Ganesha was found by Ramchandra Mehendale. Thereafter, the temple was renovated. Peshwa Madhavrao I consecrated the ancient Ganesha image in this new temple. To see the Siddhivinayak Mahaganapati Temple in its full swing, tourists should visit during the festivals like Angarika Chaturthi, Ganesh Chaturthi, and Ganesh Jayanti. Within the temple complex, there is Titwala Talav, which is quite famous for boating. During the special festival like Sankashti Chaturthi, the temple remains open for tourists from 04:00 AM till 11:00 PM. However, the aarti schedule is followed as per the normal day. The temple remains open for the entire day, from Monday Midnight until Tuesday Midnight. However, the aarti schedule is followed as per the normal day. Throughout the year, the temple remains brimming with tourists but it remains particularly crowded on Chaturthi (Angariki) as visiting here is considered as auspicious. Festivals like Ganesh Chaturthi and Ganesh Jayanti too are celebrated with great pomp and show in the temple. Titwala Station is the closest railway station. From the station, one can take a tanga or auto. Mumbai International Airport and domestic airports are the nearest one to Titwala, which is 75 kilometres away. Close to Siddhivinayak Mahaganapati Temple, there is yet another temple sacred to Vithoba and his consort Rukmini. Vithoba Temple at Shahad and Birla Temple is also worth a visit. Tourists can also go for boating at the pond in the temple complex between 04:00 PM to 07:00 PM.